North Korea has proposed high-level talks with the US days after cancelling a meeting with South Korean officials. The National Defence Commission said it wanted “serious discussions… to secure peace and stability”. The US said it wanted “credible negotiations”, but Pyongyang had to comply with UN resolutions and move towards “denuclearisation”. US and North Korean officials meet periodically, but have not engaged in high-level talks since 2009. Earlier this year Pyongyang threatened to launch a nuclear attack on both the US and South Korea. For years the North has cajoled the US and regional neighbours with a mixture of dire threats and promises of co-operation. Correspondents say Pyongyang is constantly trying to improve its bargaining position to extract more food aid or fuel. However, the regime has conducted three nuclear-weapons tests in recent years that have even angered its only ally, China. Beijing co-authored a Security Council resolution imposing new sanctions on the regime earlier this year in response to its latest nuclear test. The North responded with increasingly hysterical threats, cut hotlines used for emergency communication with the South and withdrew workers from a joint industrial park near the border. Pyongyang finally agreed to open talks with the South earlier this week. But on Thursday, the North cancelled the meeting, accusing the South of “deliberate disturbance” by changing the head of its delegation. On Friday, Pyongyang issued an appeal calling on the South to change fundamentally its “policy of confrontation”. The National Defence Commission on Sunday said that in the meantime it proposed “high-level talks between the North and the US to secure peace and stability in the region and ease tension on the Korean peninsula”. The commission said it was willing to have “serious discussions on a wide range of issues, including the US goal to achieve the world free of nuclear arsenal”. Washington could decide the time and venue, but there should be no preconditions, the statement said. 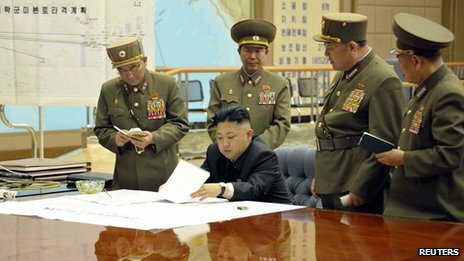 The National Defence Commission is headed by North Korea’s leader, Kim Jong-un, who succeeded his father in December 2011. For years, delegates from the North engaged with the US, Russia, South Korea, Japan and China in talks over its nuclear programme. The regime was rewarded with food and fuel aid when it gave concessions, such as destroying a cooling tower at the Yongbyon nuclear plant in 2008. However, the North walked out of the talks in April 2009 after the UN criticised a rocket launch.